Leonardo Ulloa scored his third goal of the season to earn Nigel Pearson's Leicester side their first win since they returned to the Premier League. The £8m summer signing from Brighton showed fantastic technique to check his run and tuck in Paul Konchesky's cross. Hosts Stoke bossed the first half but Peter Crouch missed their best chance. Former Inter Milan player and Argentina international Esteban Cambiasso, 34, impressed after making his Foxes debut as a substitute at half-time. Stoke will be kicking themselves after controlling the first 45 minutes and missing several good opportunities. Mark Hughes' side had been aiming to make it back-to-back wins after a famous victory last time out at champions Manchester City. But Stoke, usually so strong at the Britannia Stadium, lost for the second successive time on home soil after defeat by Aston Villa on the opening day. It was a hugely satisfying afternoon for Leicester boss Nigel Pearson, who got his tactics spot on. Well-organised and resilient, the Foxes were content to sit back and soak up the pressure in the opening 45 minutes before Pearson introduced Cambiasso at half-time. The veteran midfielder caught the eye immediately with some neat touches and always wanted the ball. 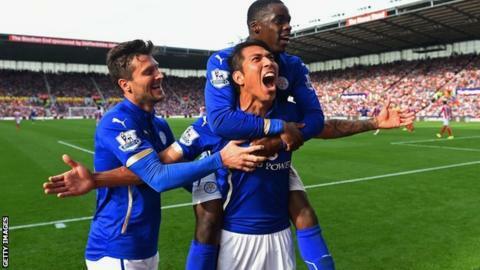 He provided the impetus for Leicester to show more ambition and they were rewarded when Ulloa struck on 64 minutes. It was a classic counter-attack move, Danny Drinkwater feeding Konchesky on the left and Ulloa making a difficult finish look easy as he halted mid-run and stretched backwards to meet the ball with his left foot. Referee Michael Oliver had played advantage when Drinkwater was scythed down after releasing the ball. Ulloa, 28, has already scored against Arsenal and Everton this season and looks an early contender for bargain buy of the summer. Stoke had their best moment in the first half when Crouch connected with a Victor Moses corner but missed the target with the goal gaping. The 33-year-old was Stoke's top scorer last season but has not netted in the league since March, although he also came close with a spectacular volley which flashed over the bar. Stoke were a little lacklustre after the break but showed more urgency towards the end and piled on the pressure in the closing minutes. Victor Moses had two good chances but was denied by Ben Hamer as the 26-year-old former Charlton keeper, playing because of a knee injury to Kasper Schmeichel, marked his Premier League debut with a clean sheet. "To do well in any division you have to score goals and for Ulloa to get three already is great for him. "He is very popular among the players and he has settled in very well and is delivering at the moment. "The more experience the players get in this division the better, and the better I can see us performing, but there is a long way to go." "It was frustrating. On the balance of play we certainly deserved something but Leicester, to their credit, got loads of people behind the ball and cleared their lines well. "We understood what their game-plan was going to be and we need to find a way to break down teams that are resolute. "But we can't have any complaints about their game-plan because we did the same at Manchester City a couple of weeks ago." Check out the best photos from today's Premier League games on the BBC Sport Facebook page. Match ends, Stoke City 0, Leicester City 1. Second Half ends, Stoke City 0, Leicester City 1. Ben Hamer (Leicester City) wins a free kick in the defensive half. Corner, Stoke City. Conceded by Ritchie de Laet. Victor Moses (Stoke City) wins a free kick in the defensive half. Foul by Ritchie de Laet (Leicester City). Attempt missed. Peter Crouch (Stoke City) header from the centre of the box is too high. Assisted by Glenn Whelan following a set piece situation. Substitution, Stoke City. Marc Muniesa replaces Erik Pieters because of an injury. Erik Pieters (Stoke City) wins a free kick on the left wing. Substitution, Stoke City. Oussama Assaidi replaces Jonathan Walters. Delay in match Leonardo Ulloa (Leicester City) because of an injury. Corner, Stoke City. Conceded by Liam Moore. Attempt missed. Dean Hammond (Leicester City) header from the centre of the box misses to the right. Assisted by Esteban Cambiasso with a cross following a set piece situation. Jamie Vardy (Leicester City) wins a free kick on the left wing. Corner, Leicester City. Conceded by Erik Pieters. Corner, Leicester City. Conceded by Marc Wilson. Victor Moses (Stoke City) wins a free kick on the left wing. Substitution, Leicester City. Jamie Vardy replaces Jeffrey Schlupp. Attempt missed. Dean Hammond (Leicester City) right footed shot from outside the box is close, but misses to the left. Assisted by Paul Konchesky. Attempt blocked. Daniel Drinkwater (Leicester City) left footed shot from the centre of the box is blocked. Assisted by Leonardo Ulloa. Attempt saved. Steven N'Zonzi (Stoke City) header from the right side of the box is saved in the top centre of the goal. Attempt blocked. Marc Wilson (Stoke City) right footed shot from the centre of the box is blocked. Assisted by Ryan Shawcross with a headed pass. Substitution, Stoke City. Mame Biram Diouf replaces Bojan. Corner, Stoke City. Conceded by Jeffrey Schlupp. Corner, Stoke City. Conceded by Wes Morgan. Attempt blocked. Steven N'Zonzi (Stoke City) left footed shot from the centre of the box is blocked. Assisted by Peter Crouch. Delay in match Erik Pieters (Stoke City) because of an injury. Attempt missed. Bojan (Stoke City) right footed shot from outside the box is too high. Assisted by Peter Crouch with a headed pass. Marc Wilson (Stoke City) wins a free kick in the defensive half. Goal! Stoke City 0, Leicester City 1. Leonardo Ulloa (Leicester City) left footed shot from the right side of the six yard box to the bottom right corner. Assisted by Paul Konchesky with a cross.